석등이 세워져 있는 곳은 백암사 또는 대동사터라고 전하여 오나 분명하지 않으며, 이 석등도 무너져 흩어져 있던 것을 복원한 것으로 원래의 위치는 알 수 없다. 여덟 장의 잎이 달린 연꽃을 조각한 둥근 아래받침돌 위에 아무런 새김이 없는 8각의 긴 가운데기둥을 세워 신라석등의 경쾌한 특징을 보이고 있다. 그 위로 꽃봉오리같은 윗받침돌은 안에 얕은 홈을 파서 불을 밝히는 화사석(火舍石)을 고정시키는 역할을 하도록 하였다. 화사석은 8각으로, 4면은 창을 내고 4면은 사천왕입상(四天王立像)을 매우 뛰어난 수법으로 도드라지게 새겼다. 화사석은 불을 밝혀두던 공간으로 불빛이 있던 옛모습을 떠올리면 흥미롭다. 지붕돌은 밑면에 1단의 받침이 있으며, 그 안쪽으로는 홈을 파서 화사석을 끼워 고정시키도록 되어 있다. 지붕돌의 경사면은 얇지만 뚜렷하게 각을 지어 신라시대의 전형을 이루고 있다. 귀퉁이에는 꽃조각이 있었으나 지금은 모두 깨어져 그 흔적만 남아있다. 꼭대기에는 8잎의 연꽃 문양조각만이 남아 있을 뿐이다. 아래받침돌과 윗받침돌을 화사하게 장식하였고, 특히 화사석을 고정시키기 위한 홈과 사천왕상의 배치 등은 주목되는 수법이다. 전체적인 양식으로 보아 통일신라 중기인 8세기 후반의 우수한 석등이라 할 수 있다. 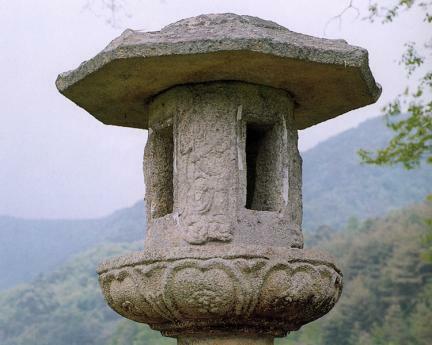 The temple at the site of which this stone lantern is located is variously called Baegamsa or Daedongsa Temple. The original location of this lantern is unknown because it was restored. 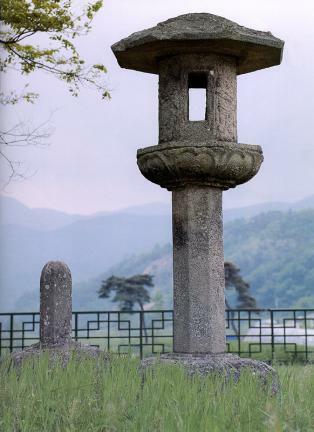 It shows the light features of Silla stone lanterns by setting up a long octagonal pillar on a round lower pedestal decorated with eight lotus petals. 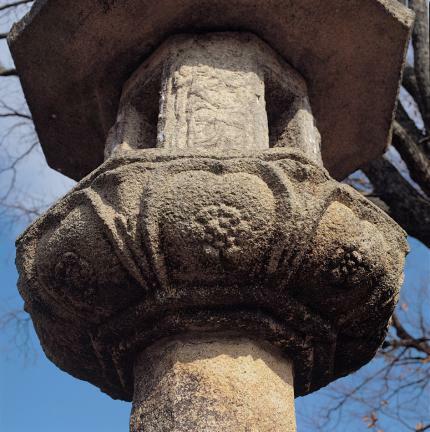 A bud-shaped upper pedestal on the pillar has a shallow hole in which the octagonal light chamber can be fixed. There are square openings on four sides of the light chamber and the Four Guardian Kings sculpted in relief with an excellent technique on the other four sides. It is fascinating to imagine the light chamber with the light on. The roof stone has a single-tiered base which has a hole for the light chamber to be inserted. 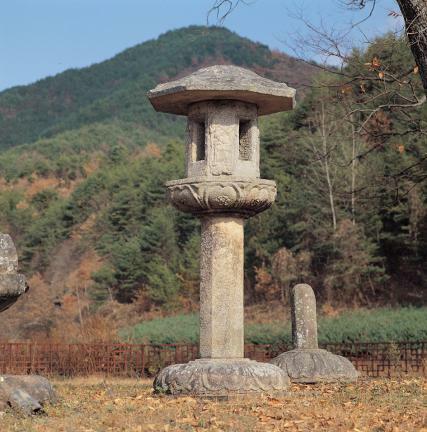 The roof follows the typical pattern of Silla Period with a gentle slope and clear angles. The carvings of flowers on each corner have been seriously damaged and only a trace is left. 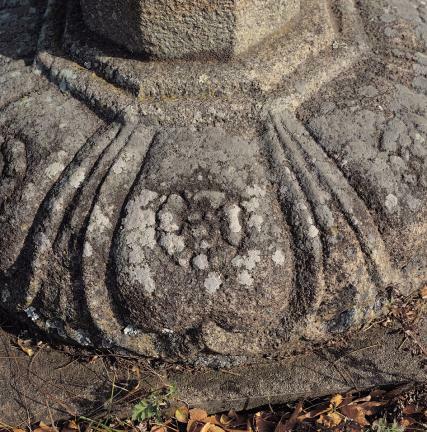 The finial is also missing except for a sculpture of eight lotus petals. The lantern’s decoration on the upper and lower pedestal is splendid. The hole in which the light chamber is fixed and the arrangement of the Four Guardian Kings are especially remarkable. 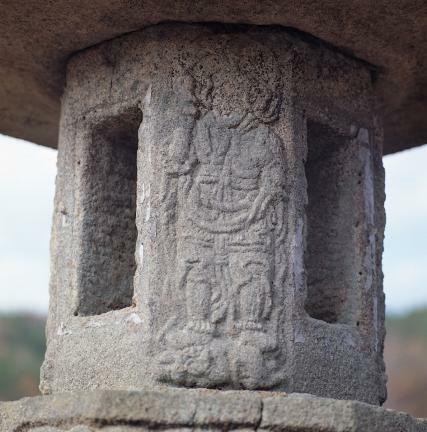 It's a masterful example of the stone lantern of the late 8th century during the middle Unified Silla Period.